While this feature is usually from the perspective of the persons impacted by first responders, we are making an exception this month. The impact is not only on the resident kids of Brimfield Township, Ohio, but also on dogs, thanks to the Brimfield Police Department. The department has 16 full time officers and 10,500 residents, but one of their community outreach programs has recently received global attention. With all of the talk about writing tickets, all of you have heard me say numerous times... I do not care about tickets. I have changed my mind. When operation Safe Summer kicks off next week, officers will hit the streets looking for our target group....kids 12 and under. If a child 12 or under is observed wearing his or her helmet while biking...the child will be stopped and issued a ticket...for a free ice cream cone from Franks Drive-in, located on SR43. Many of you can imagine some of the comments that post received…especially by people who failed to read past the third paragraph. The media picked up the story, and Chief Oliver reports one of the headlines included, “Police Chief Orders Officers to Ticket Kids.” The program impact has been tremendous. The Brimfield Police Department Facebook page is now filled with photos of happy, smiling kids, wearing helmets and holding certificates for the free frozen treat. And the Department has over 70,000 likes now. Let that sink in. 10,500 residents, over 70,000 likes from 29 countries. At the Ready caught up with Chief Oliver because his department has many other programs that promote a positive community view of police, and we asked him to share a few of them. Chief Oliver has headed the Brimfield Township Department for the past nine years, and loves everything about his job. He is committed to his community, and make no mistake, he is serious when it comes to Law Enforcement. His department responds to roughly 14,000 calls a year, and effects 1,000 arrests. In 2005 a rampage shooter killed three people in his community. He is quick to praise his police force, and gives his officers the credit for making his department successful. His approach to community policing is simple: “Residents are looking for the positives.” And this department delivers. Last December, the BPD hosted “shop with a cop” and took 187 children shopping for Christmas, each receiving $100.00 worth of gifts. The current fundraising drive is for the “Back to School Shop With A Cop” that has already raised enough funds to take 80 local kids to buy new school clothes. The chief is aiming to reach 100 children, “It is an opportunity to give children who might not get new pants or shoes a chance to have new clothes, which boosts self-confidence.” The department raises the money for its community programs through donations by local businesses and fundraisers, including a car wash that generated $3,000.00 in June. They established a PayPal account, and donations go back to the kids. 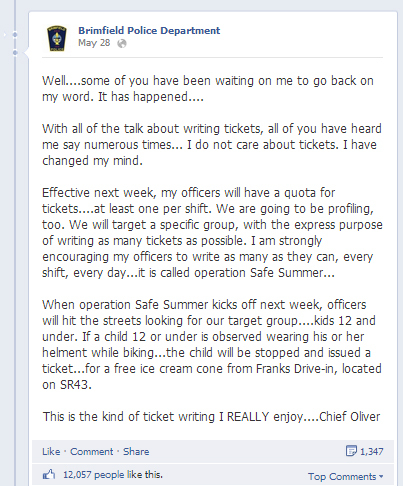 Chief Oliver is a taking his department’s new fame in stride. The post that started the Facebook firestorm was done to show that “police have a sense of humor.” This humor is not limited to human residents. The Brimfield Department includes four K-9s, three certified utility drug dogs and one new member, the only certified explosives detection dog in the county. The chief let his officers know, “If the dogs could drive, you wouldn’t have a job.” Dogs are another population of Brimfield Township who receive help from the BPD. They receive 1-2 “lost dog” calls a week, so the department started posting photos and if a dog is found, “he hangs out in the kennels with the K-9s until they are reunited with their owners.” More than once a resident has recognized a “lost dog” from the Facebook page. A look at their website, www.brimfieldpolice.com lists the dozen or so programs that the department offers to its community. Please follow them on Facebook at https://www.facebook.com/BrimfieldPolice to see the impact of their outreach and programs.